Spotify, Deezer, Google Play and more. 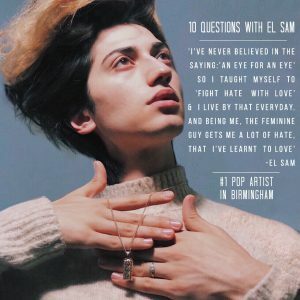 Hello ElSamDom, here are 10 Questions chosen by you that we asked El Sam to answer. Let’s Begin. El Sam, Why music? Why not dancing or any other form of art? Are you good at any form of art? Music is like the sound of birds, or traffic, or trees, it’s been the routine that we got used to going through everyday since decades and we can’t avoid. We get ready in the morning, or get on the bus, etc, we plug our music and we start our day listening. And while not everyone does that, the majority of people do, which tells you how essential music is, and how important it is in our lives. I’ve always found music to be the messanger or transmitter of news, information, energies in our lives. Proof, when you start listening to a song that makes you feel good, it brings joy to the rest of your day and it gets stuck in your head all day. Music is dangerous, but good dangerous when what you’re listening to is good. I also did professional belly dancing when I was 15, so I do love dancing which I find to be another expressive form of art. When did you know you wanted to be an artist? And how did your journey begin? I’ve always invisioned myself being an artist, from a really young age, I’m talking 7-8 years old, but never had the courage or the support from my surrounding to even think about taking that path until I reached the age of 15, when I wrote my first song and recorded it at home. My mom was a bit confused, and I didn’t even dare tell my dad that I wrote a song, but gradually I started taking more control of deciding what I wanted, and if I wanted to sing, I was going to sing. I started doing shows later on, open mic nights mainly but they were shows to me and I took it from there. To me an artist is someone who combines elements of all artistry and puts them together in one project. And I definitely find a massive difference between being an artist and being a singer, etc. There are so many singers in this industry, people who sing, they’ve got beautiful voices, amazing music, there are amazing painters who paint beautiful pictures, but there are elements that make these singers, painters, dancers…. Artists. Because I believe in what I do, and I belive the impact I can have on people and society by doing what I do. I don’t have money, I don’t have the power or authority to make things happen with a click, but I know where my power comes from, and that’s from my music. Like I said before, it’s the subjects that I put out through my art that send the messages I need to make the difference I want to make. I want to love, I want to live in a world that love, and that’s my message. I want people to acknowledge that we’re all the same, that we all exist for a reason, that we all deserve the same, that we should be there for each other when we’re needed. I want to spread every good through what I do. What’s your background and how does that contribute towards your artistry? I was born in England, to a Russian mom and middle eastern dad, I lived in the middle east most of my child and teenage hood. I love the background I come from, the culture and history of each culture is something I find very precious. I love to learn about everything, every bit of the world and the history that comes from it all. It’s something I’ve always been fascinated by, when you look at the mix of people that we come across everyday and see the beauty that they embrace and withhold within, I don’t know how to describe it, it just makes me feel happy and full of energy. Being from a mixed background has a lot of advantages when it comes to being an artist, it makes you more advanced because you can seek fractions of the most beautiful things from every mix you have in your blood, for me, it’s the music. The middle eastern tunes and rhythms are just everything to me. I feel proud when I say I can sing Arabic, and speak, I feel excited when I include that in a song I’m doing or even in the music I’m producing. I don’t necessarily have to sing Arabic, it’s the little tweaks and add-ons in the song that make a difference. Sometimes, I always found myself lost in a world of words and lyrics, and it’s very difficult to explain that to people. Being an artist is a hard thing to do, it’s actually much deeper than just singing and smiling on stage, or taking a photo and posting it on instagram. It’s a lot of thinking, most artists are depressed, and they put their lives and depression into their music. The music game is a deep one, and not many people will understand it unless they were in it. I have thankfully found the balance to make sure I don’t fall into the “Empty” and “Lonely” category, but it’s part of being an artist and I’ve accepted that. Now this is a fan question, this from Simi: what is your favourite designer brand? I would have to say, Versace, is my all time favourite brand. The pattern and colours in their designs are absolutely eye catching, I love a good pattern, and I live for a combination of colours that include gold. What does it feel like being an open, free, and outspoken artist? This is a question from your fan Malika Bah. I love being at this point of my life where I feel confident to be outspoken. I’m excited to grow my following because I want my impact to affect and help more people. I believe we are walking into a new generation of acceptance and love, and being outspoken and open is essential. I feel proud of myself and proud when I walk and see people being confident and proud of who they are. How do you deal with hate? Honestly, I think it’s all a matter of ignoring it and just brushing it aside. My dad always told me to get back at everyone who did me wrong. I’ve never believed in the saying: ‘An eye for an eye’ so I taught myself to ‘Fight Hate with love ‘ and I live by that everyday. And Being me, the feminine guy gets me a lot of hate, that I’ve learnt to love. Lastly, what’s your life goal? To be happy, to be successful, to forever do music as full time job and get all the resources I can get to enlarge and spread the messages I want to spread with my music. I want to release more and more music, and tour the world one day soon. Maybe tour it a few times, but one for now. Watch El Sam’s journey attending and performing live at the Blogosphere Awards 2018 – London. After being invited to perform at Blogosphere Magazine’s cover reveal party – Dina Tokio issue – in 2017, El Sam was invited to perform again at one of Blogosphere’s annual awards ceremony. Accompanied by his best friend and creative director Talvin, they made a short video of the journey to the awards.. I present to you my new pop with Arabic touch single #LiveOrDieElSam featuring my amazing friend and artist Christian Deveaux, and filmed by no one but my best friend Talvin Stockwin. If you want to dance, this is the song to do it to. We’ve created something out of both of our comfort zones and came up with #LIVEORDIE. Check the video out here, also featuring Ids Queens who did a great choreography. Click the link below and check it out, and please don’t forget to share it with your online friends. Stay awesome and dance. 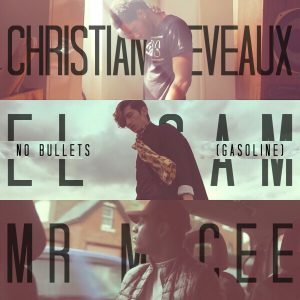 No Bullets (Gasoline), with Christian Deveaux and Mr Macee. English Language university student, Declan Bowring, had a sit down with El Sam to talk about Music, Art and Live Performances. “I love the city, the diversity of the people and the growth we are evolving into, so being an artist in such place is quite magical,” he explains while discussing what it’s like being an artist in a city like Birmingham. He expresses excitement that regardless of what a venue seems like, it’s in his hometown, so he knows it is going to be a good show. Such a performer still gets nervous prior to a show, he admits, but the audience’s excitement and fun allows him to “have a good time”. – Counteract Magazine.